For all the laughs and real-time information it provides, Twitter is often a frighteningly hostile place. Anonymity and anger make for a combustible combo. Ask Wolfpack kicker Kyle Bambard. 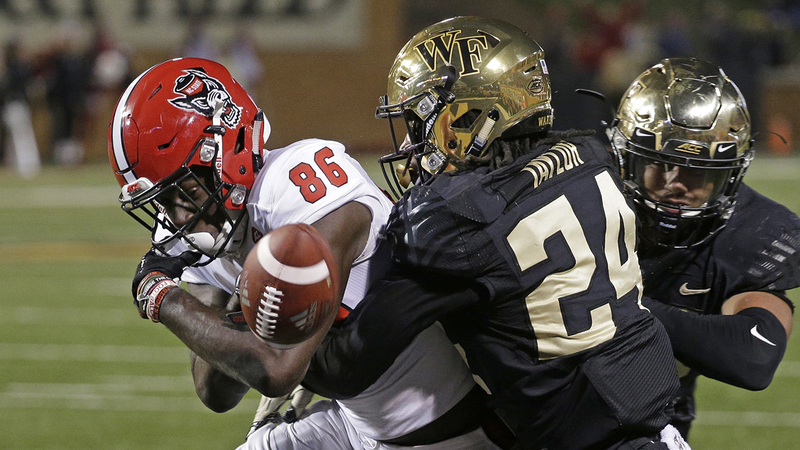 That brings us to NC State's heartbreaking loss at Wake Forest on Saturday night. Down 6, the Pack seemed headed to victory when freshman wideout Emeka Emezie caught a pass from Ryan Finley, cut inside and zoomed toward the end zone. Just as he was about to cross the goal line, Emezie was met by two Deacon defenders. Anticipating the contact, he shot the ball out forward, trying to break the plane of the goal line to ensure a TD. It backfired. Wake Forest linebacker Demetrius Kemp jarred the football loose and recovered it in the end zone. The officials immediately ruled the play a fumble and touchback and in the absence of a compelling angle proving otherwise, the play was upheld after a review. That's where things took a heartwarming turn. Rather than being met with a cascade of ugliness, Emezie's mentions instead filled up with encouragement. NC State fans, and several fans of other schools, chose to lift his spirits. At last check - nearly 900 people have chimed in, responding to his tweet with kindness rather than cruelty. It's a very cool thing to see.